Ruby wakes up from one of her many vivid nightmares and for a few seconds doesn't know where she is. She spent the night as Lucie, a young Czech living under Nazi occupation, watching the love of her life being taken away to a concentration camp. Getting over the horrible dreams would be difficult as it is, but Ruby also needs to come to terms with her inexplicable knowledge of Czech and German. Her family has never said a word in a foreign language, so where do her linguistic abilities come from? And should she pay any attention to a fortuneteller at the county fair? The odd woman checks Ruby's palm and mutters, “Forget everything and don’t try to find the answers. Don’t drag your sister into scrutinizing the past.” Ruby has only one sibling, and the little dynamo Gerald would never qualify as a girl. But to dismiss the woman's cryptic advice is not easily done since Ruby's dreams reveal that the fortuneteller was somebody very close to Lucie. What if the nightmares truly are memories of a past life? I was incredibly excited to jump into this one. The premise seemed phenomenal, and the tagline on the cover "I waited for you for two years, and then I died" made me so happy I could burst. So yeah, I was excited to read this book. Then I sat down and started reading it, and I was honestly disappointed. This book was just not what I expected at all. I kept waiting for everything to come together, and for the big point of everything to shine through. I'm not exactly sure that ever happened. Sure, things worked out, but it was a lot of high school drama with a little bit of past life frustration mixed in. I was expecting there to be more focus set on figuring out what was up with her dreams, and instead I just got a paragraph or two after each dream, and a handful of bothersome conversations with friends. This book WAS NOT all bad, though. I even enjoyed some of it. But not as much as I would have liked. Ruby: She bored me sometimes. I don't feel like she was a very remarkable character at all. She's insecure, and definitely did not seem like a high school senior most of the time. Troy: I feel like he should have had a bigger part in this story, all things considered. But instead he got a few fleeting thoughts here and there. I also didn't like how HE acted throughout the book. Who ditches their best friend like that? Not that Ruby was too great herself, but still. I DID like him around the end, though. I have a feeling his character is only going to get better. Adam: I liked Adam. I liked him A LOT. But I don't see why his character was made to be so important. Maybe that'll be shown in the next book? Also, Adam was bossy. Super controlling. He would have earned a slap across the face if I had been in Ruby's situation with him sometime. And this guy and his feelings. They changed so quickly! I'm not going to spoil, though. Uuuugh. This boy just played with my emotions a bit. In the end, though, he pulled through like Troy. Plot. I got so bored sometimes. But then there would be redeeming moments and I wouldn't want to miss a thing! And Ruby's past life...it was so incredibly sad. I feel for Petr the most. Having to wear the star...anything Holocaust when I'm reading is almost always redeeming. I feel for it so much. But as I said, this book is heavier on the drama. There were little nuggets of nice things strewn about the pages, but other parts did drag the story down, and also SLOW it down. Romance. Not as great as I'd hoped it would be. It's a reincarnation love story! Should be great, right? But it wasn't, really. I found myself wishing the romance was sweeter. There were, of course, some sweet moments, though. Especially with Petr. Oh, I love that boy. Adam said a few right things, too, and Troy pulled through in the end. Overall, I wished for more. The ending. Total cliffhanger. But it DID leave me wanting to read the next book. I honestly think the next book has the possibility to be better than the first. I'm not rushing to get to it, but it is definitely on my list. 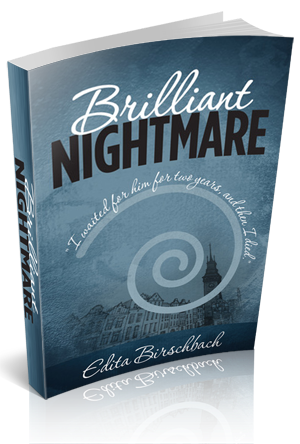 Overall, Brilliant Nightmare was not what I expected at all. It lacks much heaviness, but has quite a few redeeming qualities. I think it was a solid start for this series, and that the next book will be better. So if you want to give this one a chance, I say go for it, but don't build your hopes up super high. It's not a bad book, but it isn't one of my favorites either. I'd say it was okay.